What chocolate truly represents “DC”? What chocolate brands are made in DC? And where can you buy great chocolate in the District? Here are some essential facts for when you need a chocolate souvenir (or an everyday chocolate treat) from the nation’s capital. Washington, DC has so much to offer. Beautiful monuments, restorative and awe-inspiring museums, and the power and pulse that is the United States political system. There are delicious coffee shops aplenty, and touring the city by chocolate is not far behind. If you’re a tourist or locavore, what chocolate truly represents “DC”? What chocolate brands are made in DC? And where can you buy great chocolate in the District? Here are some essential facts for when you need a chocolate souvenir (or an everyday chocolate treat) from the nation’s capital. Harper Macaw is a chocolate brand that sources cocoa beans from Brazil, specifically from the Brazilian Amazon Rainforest and the Atlantic Forest, and has a factory at 3160 Bladensburg Road, NE (see map). One-hour tours are available for $10 on weekends. The brand is well-known for its decorative packaging style by Design Army, including a notable political series during election season. Harper Macaw was founded by a husband and wife team, Brazilian chocolate maker (Sarah Hartman) and Marine veteran (Colin Hartman). The name Harper Macaw combines two endangered birds of Brazil: the harpy eagle and the blue hyacinth macaw. The brand is passionate about agroforestry and reforestation; the company reinvests in the Atlantic Forest through partnerships with NGO’s, including the American Bird Conservancy and Rainforest Trust. The cocoa is purchased through direct-trade. The factory sells chocolate bars, cocoa nibs, and hot cocoa. 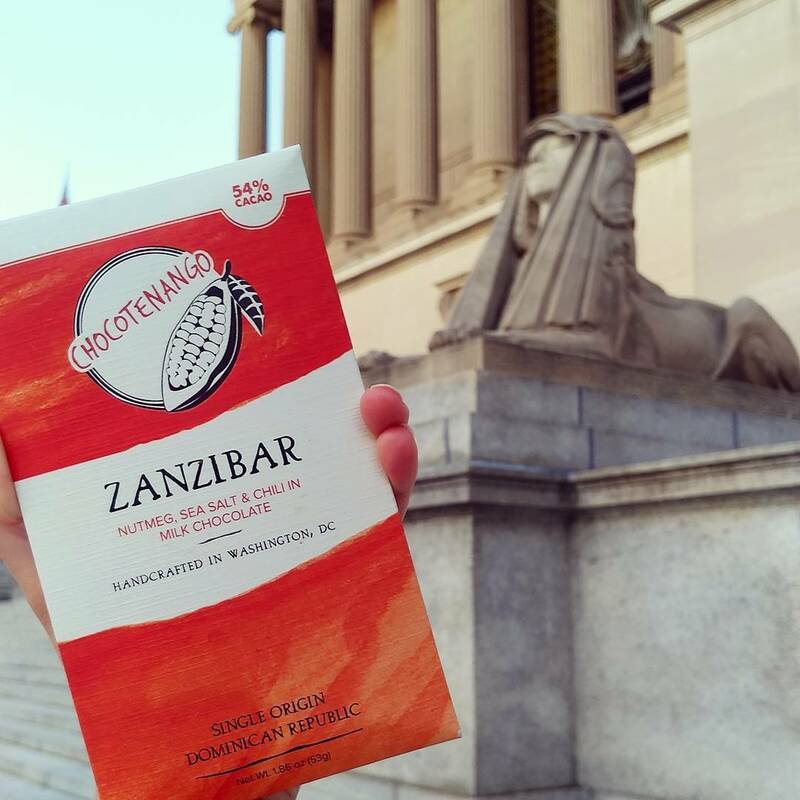 Chocotenango is an award-winning chocolate brand devised by chocolatier Ismael Neggaz, of Algeria.The brand was originally conceived in Guatemala and established in NE, DC in 2014. This year, 2016, Chocotenango brought home no less than six awards from the prestigious International Chocolate Awards, with honors for: world (for the micro-batch origin milk bar, 50%), USA and the Americas. Browse the award-winning selection, here. Did you know that a DC chocolate brand was thus decorated?! The brand donates a percentage of each bar sold to Ecologic Development Fund. Chocotenango treats are sold at The Chocolate House (see below). Second, finding good chocolate (for purchase) in DC is easy! The Chocolate House (formerly Cocova) is a chocolate shop that curates craft chocolate in NW, DC near Dupont Circle. The current sample list of worldwide chocolate brands can be found here. Clearly, it’s a fantastic spot to find all sorts of fine chocolate bars. Visit The Chocolate House to get all of the DC chocolate bar selections listed in this guide (and more) in one convenient place. This is a Time Cupsoul chocolate go-to! Chocolate Chocolate is a small but special DC shop in NW (near Farragut North), located at the base of an office building. The shelving may be limited compared to other spaces, but the service and the selection is top tier. This shop is great for personal or corporate gifts, especially with a DC vibe; many patrons enjoy the shop’s monument-shaped chocolate offerings. Go to Chocolate Chocolate to get quality level chocolate in the shape of a DC landmark! Kron Chocolatier is located in NW, DC, and Time Cupsoul has dedicated an article to the shop. It offers its own chocolate creations packaged in well-known beautiful flower boxes. Family-owned, located in Chevy Chase, NW, DC. J Chocolatier is another DC chocolate shop boutique that offers excellent global selection as well as their own brand of bars and bon bons. The likability of this shop is that it’s in a small upstairs space near Eastern Market in SE, DC. The room is decorated with chocolates, delicately and purposefully placed like precious jewels angled for admiration. J Chocolatier is a small upstairs hideaway and escape from the hustle and bustle of DC, yet still within the fun and diverse streets of Eastern Market. One could affectionately term this shop ‘the special chocolate attic of the District.’ Please see this post for further reflections. Finally, in addition to the chocolate-specific shops, DC’s organic and specialty markets (such as Whole Foods, Glen’s Garden Market) and specialty stores (think Maketto or Salt and Saundry), often carry unique chocolate brands. Coffee shops such as Compass Coffee, the Wydown and Dolcezza Gelato & Coffee, definitely carry unique chocolate brands, as well. Have fun exploring DC’s craft chocolate scene! Chocolate suggestions? DC chocolate tips? Please comment below. Taking a road trip? 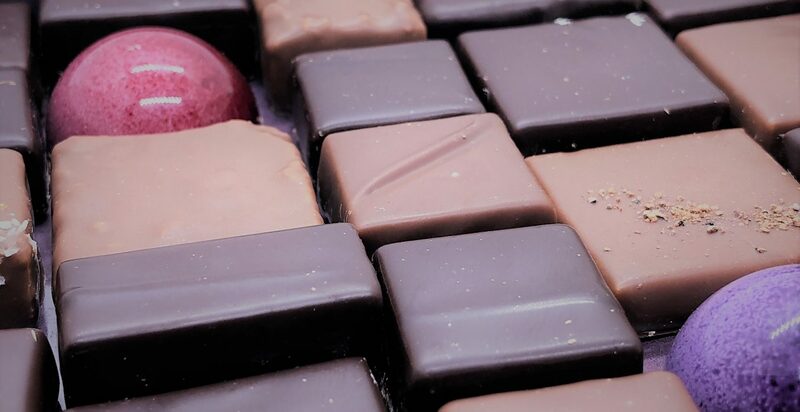 Award-winning SPAGnVOLA (MD), Zoe’s Chocolate (MD), Fleurir Chocolates (formerly in Georgetown, DC, now in VA), Artisan Confections (VA) and Potomac Chocolate (VA) can be found in a car ride just beyond Washington, DC.